In this edition of Muscle Car Milestones, we’ll take a look at the 2004-2006 Dodge Ram SRT-10. Remember the Dodge Li’l Red Express? That red stepside truck with wood trim and chrome side pipes that Dodge built in the late 1970s. It was the fastest production vehicle in its day and had enough firepower to outgun the Chevrolet Corvette. That was then and this is now. Today, the Dodge Ram SRT-10 is the fastest production truck ever created. It’s held that record for over 12 years and it doesn’t appear to be dethroned anytime soon. 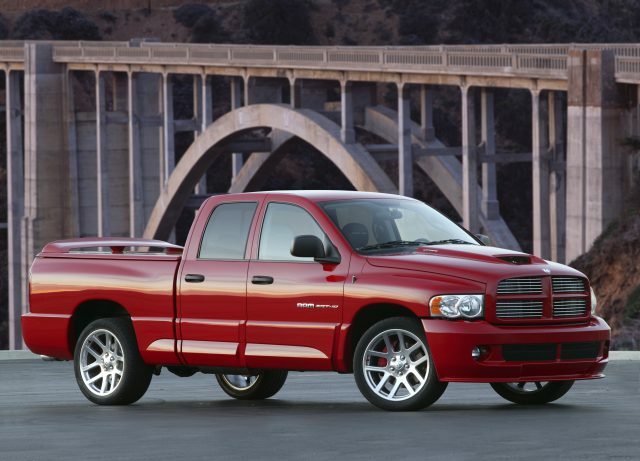 And just like the Li’l Red Express, the Dodge Ram SRT-10 is a force to be reckoned with. No other truck out there is quite like it. Dodge unleashed the Ram SRT-10 at the 2003 Chicago Auto Show on February 13, 2003. It was introduced as a member of the “500 Club” with 500 horsepower, 525 foot pounds of torque, 505 cubic-inches of V10 power, and a 500-watt sound system. It also boasts having the highest displacement of any stock pickup on the street as well as the most horsepower ever available in a stock setup. On February 2, 2004, the Ram SRT-10 was certified by Guinness World Records as the fastest production pickup on the planet. To get inside the prestigious Guinness Book of World Records, it had to beat the record set the previous year by the Ford F-150 SVT Lightning. It did so by 7.047 seconds. A stock SRT-10 posted a two-lap, both-directions average speed of 154.587 over a one kilometer distance at the DaimlerChrysler Proving Ground’s 4.71-mile track in Chelsea, Michigan. This monumental record still stands today. So how do the SRT-10 and Ford F-150 SVT Lightning compare in a 0 to 60 and quarter mile shootout? Given the SRT-10 outguns the Lightning by 75 horsepower, is a duel between these two fair? Regardless, the Lightning is the SRT-10’s foremost competitor so a comparison between the two was inevitable. Back in June 2004, Truck Trend staged a faceoff between these two adversaries. From 0 to 60, the SRT-10 is 0.2 seconds faster with a run time of 4.9 seconds. And in a quarter mile contest, the SRT-10 is 0.3 seconds quicker with a run time of 13.3 seconds on the stopwatch. For 2005, the Ram SRT-10 grew a couple more doors. The SRT-10 Quad Cab was developed for drivers wanting breakneck performance, room for the family to tag along, and the ability to tow the Viper to the track or the boat out to the lake. The quad cab was available exclusively with a 48RE four-speed automatic transmission capable of towing 7,500 pounds. In order for the SRT-10 to tow that much heft, it comes equipped with a special transmission cooler, heavy-duty torque converter, and unique front and rear strut and spring assemblies. Performance does suffer slightly with the quad cab. For their January 2005 issue, Car and Driver magazine put the SRT-10 quad cab through its paces. They were able to push the quad cab from 0 to 60 in 5.6 seconds and run the quarter mile in 14.2 seconds running 99 miles per hour. Those results are still pretty impressive considering the SRT-10 Quad Cab weighs around 5,600 pounds. For the driving enthusiast, the SRT-10 is still available in regular cab form with a T-56 six-speed manual transmission connected to a Hurst shifter. And with enhancements such as a new 4.56 axle ratio, drivers should experience improved launch feel and low-end acceleration with the regular cab model. There’s more to the Ram SRT-10 than meets the eye. Dodge didn’t just plant a Viper V-10 engine under the hood, slap on some cool-looking wheels, and then call it a day. Nope, this beast was a carefully planned machine with performance in mind. For starters, the frame is fully hydroformed for strength and equipped with fully tuned front and rear strut assemblies. The SRT-10 also has an independent front suspension and in the rear, axle snubbers, performance-tuned springs, and Bilstein shock absorbers add to the performance handling. To bring the truck to a stop, the SRT-10 relies on four-pot opposed piston calipers and a three-channel anti-lock braking system with 15-inch rotors up front and 14-inch rotors in the rear. Remember the old saying, if it isn’t broken, why fix it? With that in mind, not much changed for the SRT-10 in 2006. Inferno Red and Mineral Gray Metallic were added to the color palette. The quad cab got a bigger 34-gallon gas tank. The regular cab now came standard with a tonneau cover with body-color rear wing. Both cab configurations got a bed tray standard as well. To keep the kids entertained on those long trips, a rear video entertainment system was now available in the quad cab. Searching the web, we found prices for low-mileage Ram SRT-10’s range from $25,000 to $35,000. That’s a pretty good bargain considering you get Viper-like performance for a fraction of the price. The Dodge Ram SRT-10 rode off into the sunset after the 2006 model year. Just like the Li’l Red Express before it, its time was brief and flew by as fast as the SRT-10 down the strip. Today, it’s still the reigning speed king of performance trucks. And with no contender coming down the pike anytime soon to challenge its supremacy, that record will probably stand for quite some time. This is nonsense, the Tundra TRD was way faster, 0-60 in 4.4 seconds anyone? It came with a supercharged V8 that made 500 horsepower.